Solterra — Plan West Inc.
Plan West was selected in 2012 to introduce a variety of mixed density housing to the SOLTERRA Community. Plan West prepared alternative site designs mixing single-family detached, attached, semi-attached, and townhomes for the development of several new neighborhoods. To emphasize the pedestrian-oriented community, we worked closely with Brookfield Residential, the civil engineer, and the City of Lakewood on the layout. 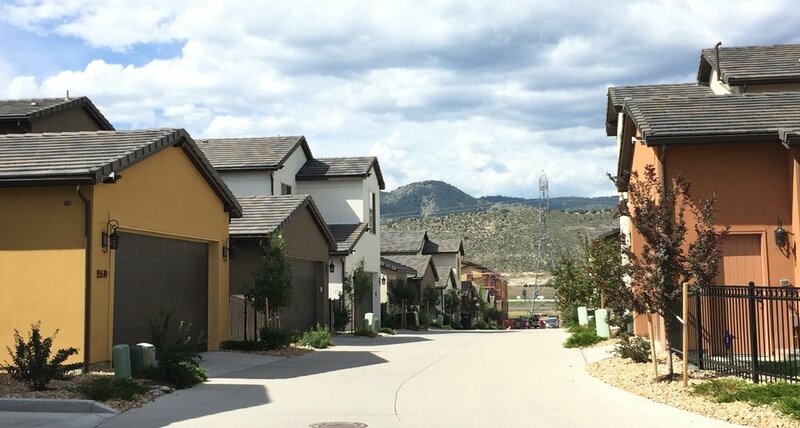 In addition, we custom designed new public street sections, green belts, and an alley with detached walks, tree lawn, and side-loaded garages. We invented the alley on steroids. The park design was the result of an extensive outreach to the community to establish specific needs and desires. The park, as a central focal point to the neighborhood, was substantially completed in the first quarter of 2018. Plan West continues to provide Brookfield Residential planning and design services for each new filing to continue the successful mixed density neighborhoods.